Three months ago I was made redundant, this week I started in a new job. If that's not a good enough reason for a special occasion I can't think of many better ones. We set up a video call using the webcams we had bought a while ago. I showed my parents how I opened my bottle and poured my dram. My mother then poured a dram for my father and one for herself, they were having a Laphroaig Quarter Cask Double Cask Matured. 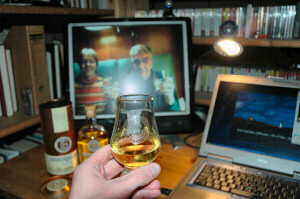 When we were ready on both sides we lifted our glasses so that we could see them on our respective monitors. Slainte! 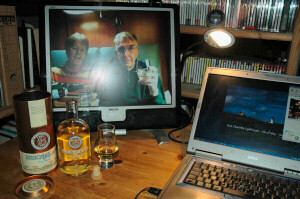 While we couldn't share the whisky as such we could at least see each other enjoying our drams and talk to each other (yes, those are my parents on the pictures above, I took a few pictures to document the occasion).